The first Glenn Miller Orchestra did not make it at all. It was a total and absolute economic failure. But Glenn knew what he wanted, held to that dedication and relentlessly worked to succeed. He launched his second band – the one that lives on today – in March of 1938. The Glenn Miller Orchestra has been a “hit” ever since. The legendary Glenn Miller was one of the most successful of all dance bandleaders back in the Swing Era of the 1930’s and 40’s. A matchless string of hit records, the constant impact of radio broadcasts and the drawing power at theatres, hotels and dance pavilion, built and sustained the momentum of popularity. Glenn disbanded his musical organization in 1942 at the height of its popularity to volunteer for the Army. There, he organized and led the famous Glenn Miller Army Air Force Band. It went to Europe to entertain servicemen performing numerous live and radio shows. On December 15, 1944, Major Miller took off in a single engine plane from Europe to precede his band to France, disappearing over the English Channel, never to be seen again. The army declared him officially dead a year later. With the release of the major motion movie The Glenn Miller Story featuring Jimmy Stewart and June Allyson in 1954, interest and popular demand led the Miller Estate to authorize the formation of the present Glenn Miller Orchestra. 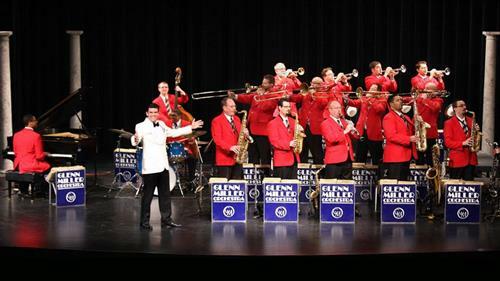 On June 6, 1956, and under the direction of drummer Ray McKinley who had become the unofficial leader of the Army Air Force Band after Glenn’s disappearance, the reformed Glenn Miller Orchestra performed its first concert and has been on the road ever since. Since January 2012, vocalist Nick Hilscher leads the 18 member band. The Glenn Miller Orchestra today is still the most sought after big band in the world. Students will be able to visit with Orchestra members after the 4:00 sound check. ***CASH BAR*** Co-Sponsored by the Wold Foundation, Rocky Mountain Power, the Des & Carrie Bennion Family/Bon Agency Insurance, KCWY-13, and TownSquare Media. Partial funding is from the Wyoming Arts Council, WESTAF (Western States Arts Federation), and the National Endowment for the Arts, the Schneider and Cate Funds in the Wyoming Community Foundation-Casper, and Natrona School District No. 1.